Welcome to the first post of my reinvigorated blog page. I've been meaning, for a while, to get some of my miniatures photographed and up online, so here's the first: my recently completed Tau Shas'ui Battlesuit. 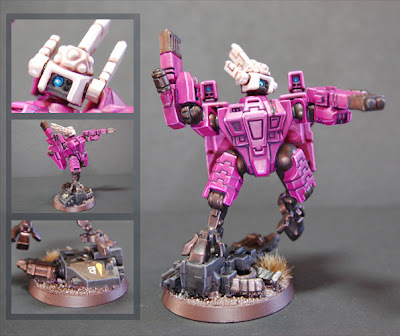 I converted up the model several years back and always intended to use a bright colour scheme, but have only recently gotten round to it after discovering the Citadel Spraygun, which, is awesome. The main armour colour was achieved with two thinner layers of Warlock Purple with the spraygun over a Chaos Black undercoat. This was then washed with Leviathan Purple, before applying two further thin (brushed) layers of Warlock Purple, taking care not to paint into the recesses. This was then highlighted with a 1:1 mix of Warlock Purple and Tentacle Pink before a final spot highlight of straight Tentacle Pink. All metal areas were (unusually simply for me) Tin Bitz, washed with Badab Black. The darker armour on the suit and the Dreadnought arm on the base was basecoated Charadon Granite, washed with Badab Black and highlighted with Adeptus Battlegrey. The lighter armoured area on the head was basecoated Dheneb Stone, washed with Ogryn Flesh, then repainted Dheneb Stone, taking care not to cover the shaded recesses, then highlighting with a 1:1 mix of Dheneb Stone and Skull White. The lenses were basecoated Hawk Turquiose, highlighted with a 1:1 mix of Hawk Turquiose and Ice Blue with spot highlights of Skull White. The base is painted Scorched Brown and the sand on top is drybrushed Dheneb Stone. A 'Highland Tuft' from the new range by the Army Painter, was added as extra detailing. For the transfers, I use a two-part treatment called Micro-Set and Micro-Sol. I use one (instead of water) to loosen the decal from the backing paper and apply a small amount to the surface that the transfer will be placed. Slide the decal as per normal and remove any excess liquid with the corner of a paper towel. Then use the second part of the treatment to further thin the transfer and help adherence. Once we're all dry, apply a small amount of matte varnish to seal it on, and you're good to go. Hope you guys like the end result. I'm going to be putting some more examples up over the coming days. Look forward to receiving any feedback.